When The Car Is The Driver : All Tech Considered A fleet of Google's robotic cars has been tested more than 200,000 miles over highways and city streets. And Nevada has finalized rules that give special driving permits to the self-driving cars. In the video above, Sebastian Thrun, who helped build Google's driverless car, narrates a demonstration of the technology. This week the state of Nevada finalized new rules that will make it possible for robotic self-driving cars to receive their own special driving permits. It's not quite driver's licenses for robots — but it's close. The other day I went for a spin in a robotic car. This car has an $80,000 cone-shaped laser mounted on its roof. There are radars on the front, back and sides. Detailed maps help it navigate. Do people notice it's a self-driving car and gawk? "We get a lot of thumbs up," says Anthony Levandowski, one of the leaders of Google's self-driving car project. "People drive by and then they wave. I wish they would keep their eyes on the road." Levandowski is in the passenger seat with a laptop showing him what the car can see. Chris Urmson is behind the wheel. But his hands are in his lap and the steering wheel is gently turning back and forth, tracing the contours of California's busy Highway 85. "And it can adjust the speed. If there is a particularly tight corner, it will slow down for that," Urmson says. "It adjusts speed to stay out of blind spots of other vehicles. It tries to match speed with traffic." 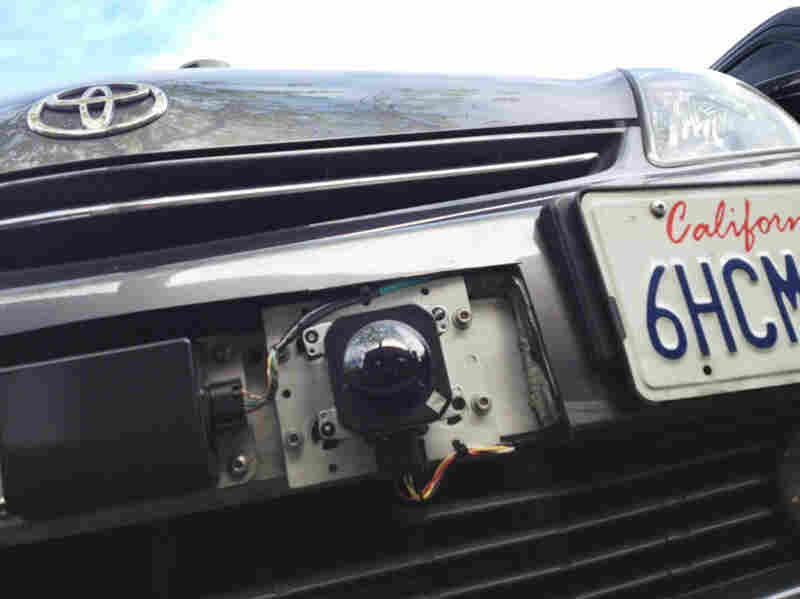 A car camera attached to the front bumper of Google's driverless car. Urmson has been working on this technology for close to a decade. His first car managed to travel just 11 miles on a dusty road. Google's vehicle is a giant leap forward. "When we got this on the freeway and it was doing 70 miles an hour and just smoothly driving along the road, you could taste it — the technology," Urmson says. "You could really feel the impact and how it's going to change people's lives. It was just amazing." While he was talking, a motorcycle cut us off. The car saw the move coming, and we hardly even noticed. Google's fleet of robotic cars has driven more than 200,000 miles over highways and city streets in California and Nevada. Google did this testing in kind of a legal limbo. These cars aren't forbidden, but, "There was no permission granted for any of that to happen by anybody," says Steve Jurvetson, a venture capitalist and robotic car enthusiast. "It's essential that there be a place to do tests," he says. "There's two ways to do it — the seek-forgiveness strategy and the seek-permission strategy. Frankly, the 200,000 hours I think that have been driven here in California — that's a seek-forgiveness strategy. Right?" If anything went wrong, Google would have had a huge amount of explaining to do. So last year, the company hired a lobbyist in Nevada. "The state of Nevada is close, it's a lot easier to pass laws there than it is in California," Levandowski says. He says Google convinced the state Legislature to pass a law making robotic cars explicitly legal. But the Legislature went further than just creating a place to test these cars — it ordered the Department of Motor Vehicles to create basically a driver's license for these robot cars. "I thought it was great," says Bruce Breslow, director of the Nevada DMV. "My grandfather took me to the 1964 World's Fair in New York City many times. And they were promising me the car of the future as an 8-year-old, and I thought to myself, this finally could be it." Starting March 1, companies will be able to apply to test self-driving cars on Nevada roads. "The test vehicles will be Nevada's first red license plate since the 1940s," Breslow says. Think of it like a learner's permit — those bright red plates will let everyone know there's a student robot driver behind the wheel. "And eventually when these vehicles are sold, it will be the first ever neon green license plate that the state of Nevada will ever issue — green meaning go, and the future's arrived," Breslow says. Google says it will probably be years before cars like this go on sale. But Jurvetson, the venture capitalist, says he's convinced this technology could save thousands of lives "today, already, right now." Robots are never distracted. They don't text or drink or get tired. They see things no human can. "That front radar catches bounces off the ground," Jurvetson says. "We were driving behind an 18-wheeler, and we saw the vehicles in front of the 18-wheeler — vehicles we could not see with our eye — because the signal bounced off the pavement ... at a glancing angle underneath the 18-wheeler. And so no human will ever have the amount of information that these cars have when they are driving." While Nevada may be the first state to create a licensing system for self-driving cars, it won't be the last; Hawaii, Florida and Oklahoma are already following suit. And Jurvetson says one day we may be asking ourselves if humans should still be allowed to drive.